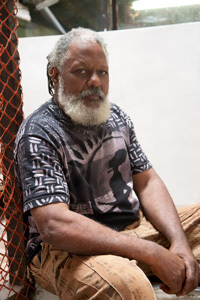 CHARLES DICKSON, born and raised in Los Angeles, currently lives and works in Compton, CA. He is primarily a self-taught sculptor whose work has been exhibited throughout Southern California. Dickson also volunteers his time and skills to workshops for children at Watts Towers Art Center and Barnsdall Park in Los Angeles.